it is quick and easy, it is delicious and very healthy. Carrots are rich in vitamins and minerals for which a carrots intake will produce an increase in the body's defenses, and also thanks to the enormous amount of vitamin A, carrots can bring a lot of benefits to the skin, helping your suntan and preventing your skin ageing. Peel the potatoes and cut into squares, clean and slice the carrots, chop up the onion, the leek and the celery stick. Apart prepare the chopped aromatic herbs. 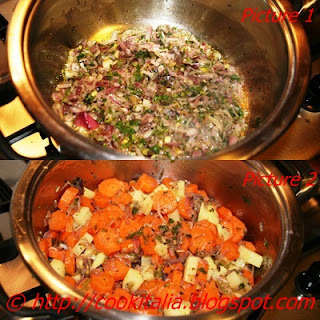 Put some oil in a saucepan and add the chopped onion, leek and celery, sauté a few minutes ( picture 1) then add the potatoes and the carrots. Cook for a few minutes and add the chopped herbs,( picture 2) a few more minutes and pour water without covering the vegetables, salt and pepper, cover and simmer for half an hour stirring occasionally. Blend everything with an immersion blender, add the grated cheese and let thicken always stirring with a wooden spoon. Take it off the heat, pour in the soup bowl, if you prefer you can serve it with a drizzle of olive oil and slivers of cheese.